AVOIDING INVESTIGATIONS – You can avoid an investigation following a railroad personal injury if you hire lawyers, such as Wilson & Hajek. BUCKINGHAM BRANCH RAILROAD – Many railroad employees of branch line railroads do not realize they have the same rights under federal law as employees of the major railroads such as Norfolk Southern Railroad Company and CSX Transportation, Inc. DIRTY TRICKS BY THE RAILROAD – A railroad conductor struck by a locomotive suffered serious and debilitating injuries. The railroad made promises to help but instead hid evidence to help themselves. FELA – LIA – SAA – A railroad injury case is handled under the Federal Employers’ Liability Act. A railroad injury on-the-job requires experienced legal advice. LOCATION OF RAILROAD INJURY TRIALS – The location of a personal injury railroad trial is important and the experience of the law firm of Wilson & Hajek plays a major role in this type decision. MESOTHELIOMA – ASBESTOS DISEASE – A Bloomington, Illinois jury returned a $90 million verdict for a retired pipefitter who developed mesothelioma, a disease caused by exposure to asbestos. RAILROAD ACCIDENT INJURY ATTORNEY – Injured on the railroad or at a railroad crossing, or by a train then you need experienced lawyers familiar with FELA and state laws. THE RAILROAD’S APPROACH TO INJURED RAIL WORKERS – A discussion of how the railroad treats its workers following an injury as seen through the eyes of a former railroad conductor and current railroad injury lawyer. 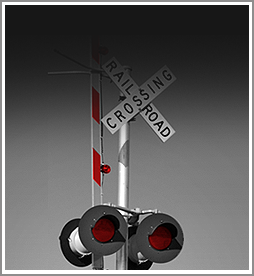 RAILROAD CROSSING ACCIDENT – Located in Charlottesville and Virginia Beach, Wilson & Hajek represent railroad crossing accident victims. RAILROAD MUST PROVIDE SAFE PLACE TO WORK – The railroad has an obligation to furnish railroad workers a safe place to work, even during bad weather conditions. Experienced FELA lawyers share information about these laws. RAILROAD RULES AGAINST THE INJURED EMPLOYEE – The railroad has rules it uses against injured employees trying to blame them for an injury. RAILROAD CROSSING ACCIDENT – Injuries are common to railroad employees involved in a railroad crossing accident. RAILROAD WORKER INJURY LAW INFORMATION AND TIPS – When injured on the railroad the employees proof of negligence under FELA is much different than the proximate cause standard that exists for most injury cases such as auto accident injuries. STATUTE OF LIMITATIONS – There are time limits in which claims can be made for personal injuries on the railroad and there are also time limits for claims of disease related injuries. WHY YOU NEED RAILROAD EXPERTS – The outcome of railroad injury trials is often decided by experts. Railroad workers can collect for injuries. Contact the personal injury law firm of Wilson & Hajek.